Sun., July 8, 2018, 8 a.m.
CARLSBAD, Calif. – Once upon a time, there was a mother fruit bat who had a newborn baby she loved very much, and she named her Stellaluna. But something did come of it. San Diego’s now-defunct Harcourt Brace Jovanovich snapped up the book and turned it into a runaway best-seller. Over the years, the book has sold millions of copies, it’s been translated into 30 languages and it’s been ranked by the National Education Association and School Library Journal among the top 100 children’s books of all time. All of the book’s hand-painted illustrations are on display in the gallery side by side with the book’s text, so visitors can walk clockwise around the gallery and read the entire book. There are also additional painting studies she did on bat wings and bodies. Cannon herself will be in the gallery every Friday from 1 to 3 p.m. painting at an easel in a corner and greeting visitors. She’ll also take part in several community events. Cannon worked for the city of Carlsbad for 12 years before leaving in 1994. 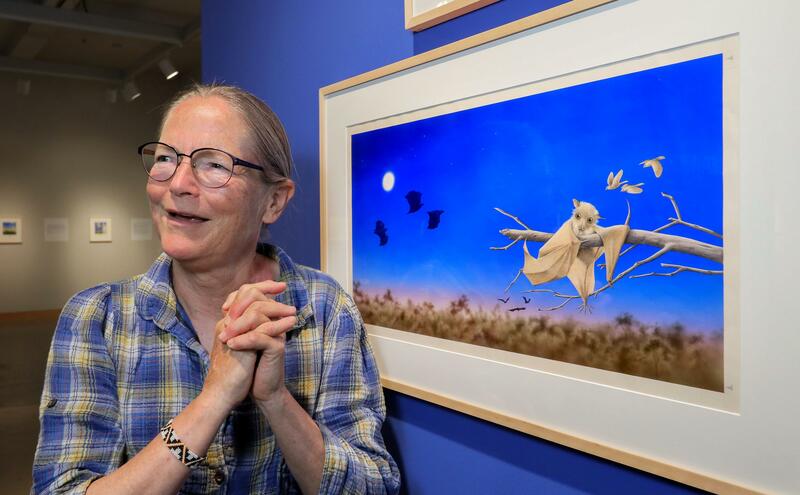 She’s excited for the exhibit because Carlsbad is where “Stellaluna” was born. Karen McGuire, curator of exhibits at Cannon Gallery, said the public is very excited about the show. She started painting in sixth grade when she found a set of acrylics tucked in her Christmas stocking. She painted on any surface she could find, from glass to wood chips, and she painted portraits from pictures in National Geographic. By high school, she was selling commissioned paintings to her teachers. After high school graduation, Cannon and her sister caught a Greyhound bus west. They worked a summer together in Yellowstone National Park then parted ways. Her sister went to college, and Cannon headed to Southern California where she struggled for years, working odd jobs and selling the occasional painting. Cannon gradually built a portfolio as a freelance artist and graphic designer. In 1982, she landed a job at Carlsbad’s Georgina Cole Library, designing murals, newsletters and children’s library programs. Over the next two years, she studied and painted bats, inspired by a National Geographic photo essay on the African epauletted fruit bat. The tiny brown creatures were both strange and beautiful, qualities she knew would appeal to both boys and girls, and she found she could paint them very well. For her book, she did all of the paintings first. Then she wrote the words, a story of tolerance inspired by a vacation in Thailand, where she experienced being the only Westerner among crowds of Thai villagers. The success of “Stellaluna” allowed Cannon to buy a home on an acre of land 20 years ago. With a game camera and a journal, she keeps meticulous records of her property’s flora and fauna. Published: July 8, 2018, 8 a.m.